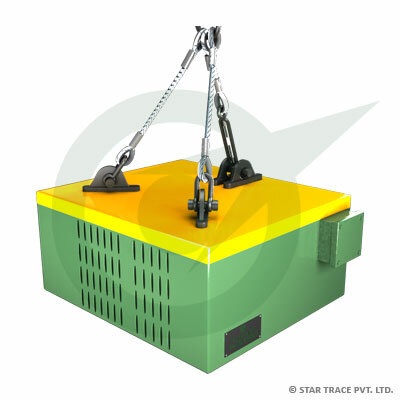 Suspended Electro Magnets | Coal Processing | Star Trace Pvt. Ltd. Suspended Electromagnets are designed for separation of ferrous metal from a variety of overthe belt conveyor applications. Proven in industries such as mining, recycling, tire shredding, pulp & paper, construction & demolition. Star Trace Suspended Electromagnets offer superior strength and reliability. Used in high volume low (less than 150mm) product depth applications, suspended electromagnets offer the ability to be turned on & off. Installation options include in-line and cross-belt configurations to meet the specific needs of your applications. As the product on a conveyor belt flows under the powerful magnetic field, ferrous material is pulled out of the product flow and held to the face of the magnet. When using a manual clean model, the collected tramp metal is held in place for as long as the unit has power. In order to clean the unit, the power source must simply be turned off, which instantly releases the metal from the magnets hold. Insulated copper coils / aluminium coils. 1 year limited warranty on coils.